Plate 34: Les ruines elle-mêmes ont péri / "Even the runis have perished" [Lucan, Pharsalia IX: 969](C & R 87c). Original aquatint, drypoint, burnisher, and roulette, 1926. 450 impressions signed and dated 1926 bottom left (there are no pencil-signed proofs) for the Miserere, one of the greatest print cycles of all time. 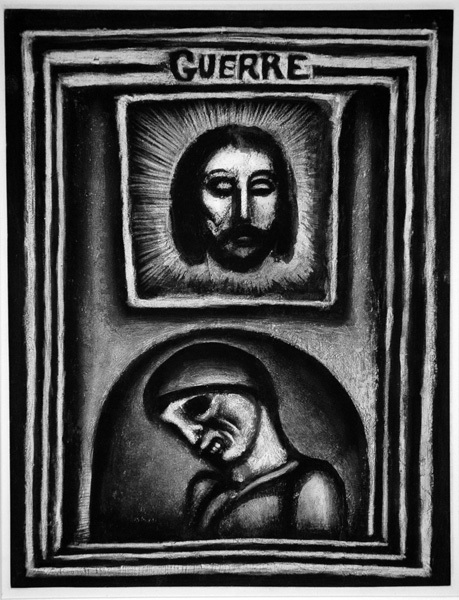 In contrast to the print that opens the whole series (see above), Rouault chose this print contrasting the image of Christ on the handkerchief of St. Veronica, who wiped His face as He went to be crucified, with the image below it of Death as a soldier to introduce the second part of the series, Guerre / War; his full title is from Lucan, the poet of the Roman Civil Wars,"They have ruined even the ruins." This second occurance of the image of Christ comes immediately after the first in the last print of Part I. It will return in plate 46, "The just man, like the sandlewood, perfumes the ax that strikes him," plate 47, ""De profundis," and the final plate in the sequence, plate 58. Image size: 585x489mm. Price: $7500. Plate 35: "Jésus sera en agonie jusqu'a la fin du monde / Jesus will be in agony, even to the end of the world [Pascal, Pensées] (C & R 88e). Original aquatint, drypoint, burnisher, and roulette, 1926. 450 impressions signed and dated 1926 twice and signed with the initials bottom right (there are no pencil-signed proofs) for the Miserere, one of the greatest print cycles of all time. Although Jesus may be forgotten in the law courts and on the battlefields, humanity's disregard of his teachings is a sin that requires constant renewals of Jesus' saving death to rescue humanity from itself. Image size: 580x410mm. Price: $7500. Plate 36: Ce sera la dernière, petit père / This will be the last time, father! (C & R 89d). Original aquatint, drypoint, burnisher, and roulette, 1927. 450 impressions on paper watermarked "Ambroise Vollard," signed and dated 1927 top left beneath the painting in the frame above (there are no pencil-signed proofs) for the Miserere, one of the greatest print cycles of all time. 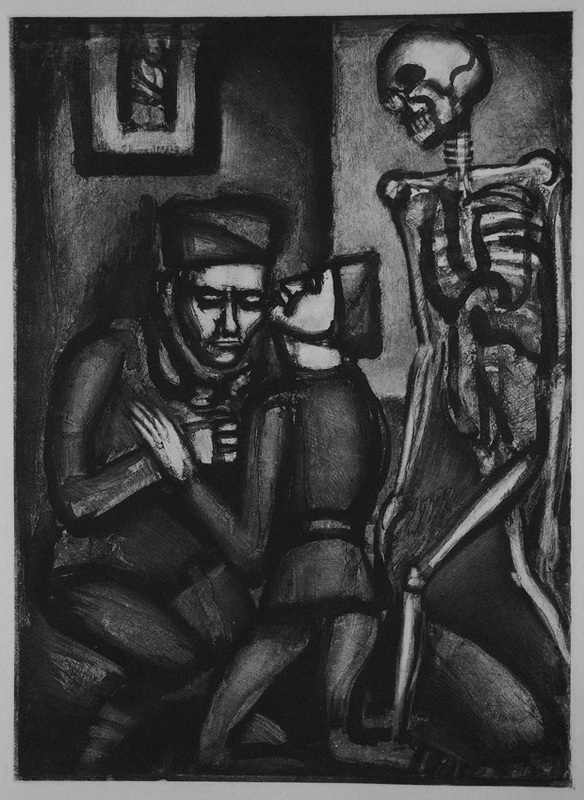 A father, himself a soldier, is kissed by his son departing for the war, who innocently proclaims that this will be the war that ends all wars; death stands mutely by scowling at such ignorance. Image size: 588x430mm. Price: SOLD. Plate 37: Homo homini lupus (C&R 90f). 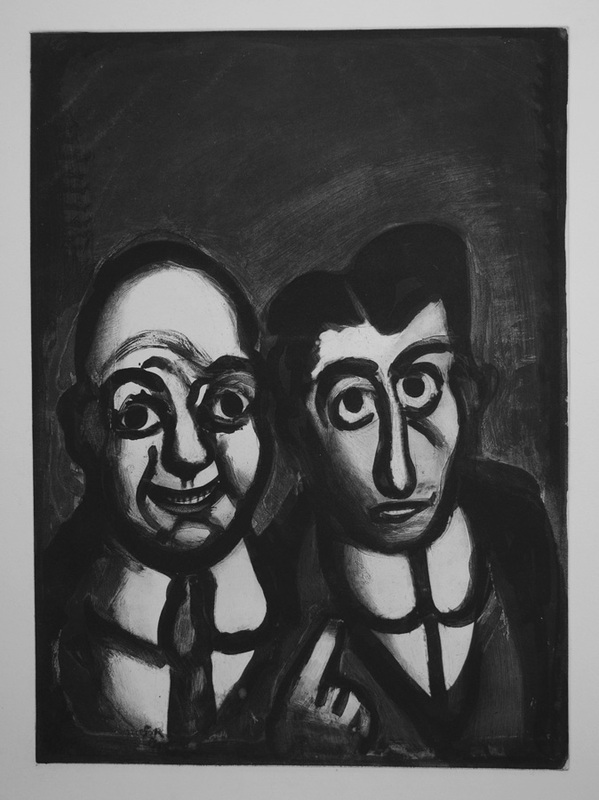 Original aquatint, drypoint, 1926. 450 impressions for the Miserere; the title comes from Plautus: "Man is a wolf to man." Signed and dated 1926 bottom left, There are no pencil-signed proofs. Image size: 580x450mm. Price: $6500. Plate 39: Nous sommes fous... / We are insane... (C&R 92d). Original aquatint, drypoint, burnisher, and roulette, 1926. 450 impressions for the Miserere. Signed and dated 1922 bottom left, There are no pencil-signed proofs. Image size: 566x410mm. Price: $6500. Flora and Kang cite Ecclesiastes 9:3: "This is an evil among things that are done under the sun, that there is one event unto all: yea also the heart of the sons of men is full of evil, and madness is in their heart while they live, and after that they go to the dead." 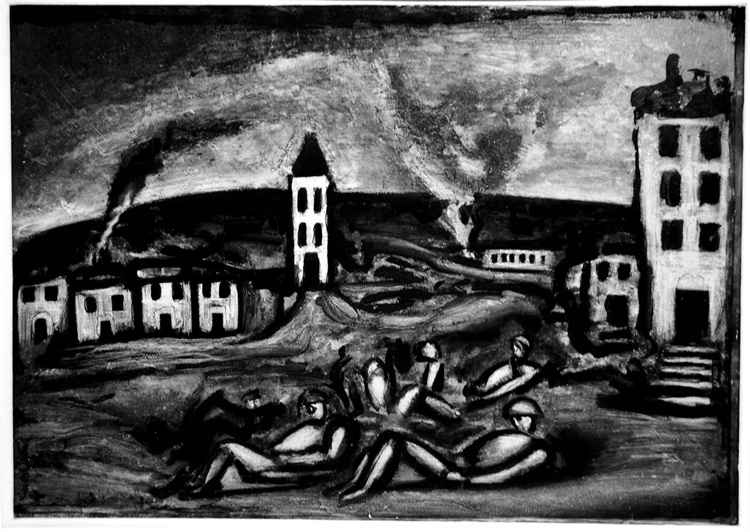 The evil, given the context, seems to be the evil of not protesting the atrocities immediately surrounding the work in the sequence, While wolvish men prowl, devouring their neighbours as prey and those with earthly power crush the weak, the rest of us do nothing to prevent these depredations. 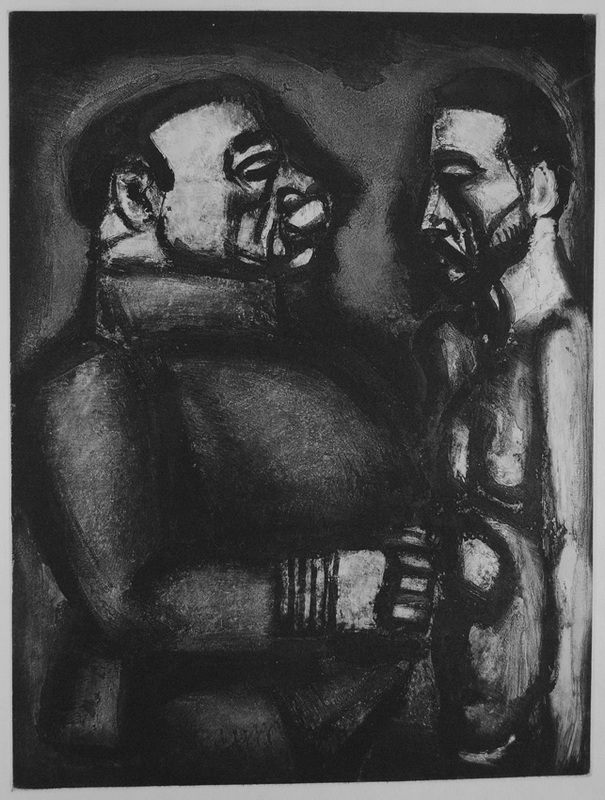 Plate 40: "Face à face" / Face to Face (C&R 93c). Original aquatint, etching, drypoint, burnisher, and roulette 1926. 450 impressions for the Miserere; the title and the image combine to show what happens when temporal power crushes those it thinks weak. Signed and dated 1926 bottom left, There are no pencil-signed proofs. Image size: 575x435mm. Price: $6500. Flora and Kang cite Matthew 27:22-24, where Pilate accedes to the demands of the crowd to crucify Jesus. Plate 42: Bella matribus detestata / Wars, hated by mothers [Horace, Odes I.i: 24-25] (C&R 95e). Original etching, aquatint, roulette, drypoint, burnishing, 1927. 450 impressions for the Miserere. Signed and dated 1927 bottom left. 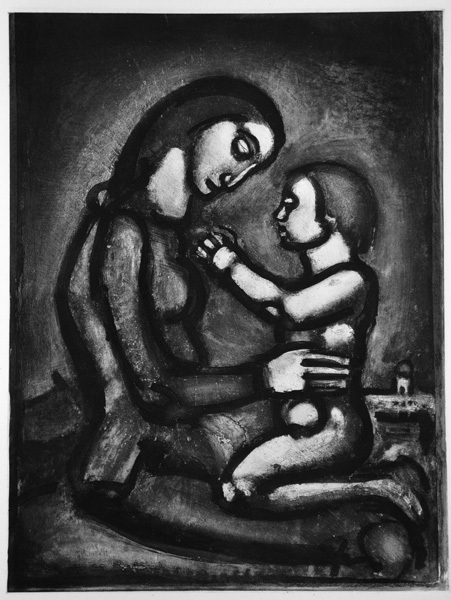 Rouault continues his theme contrasting the response of the father dully acquiescing in the inevitable to the visceral horror and rage of the mother who holds her young son lovingly. There are no pencil-signed proofs. Image size: 584x440mm. Price: $7500. Plate 43: "Nous devons mourir, nous et tout ce qui est notre" / We are doomed to die, we and all that is ours [Horace, Ars Poetica, 63] (C&R 96c). Original etching, aquatint, roulette, drypoint, 1922. 450 impressions for the Miserere. Signed and dated 1922 bottom right. 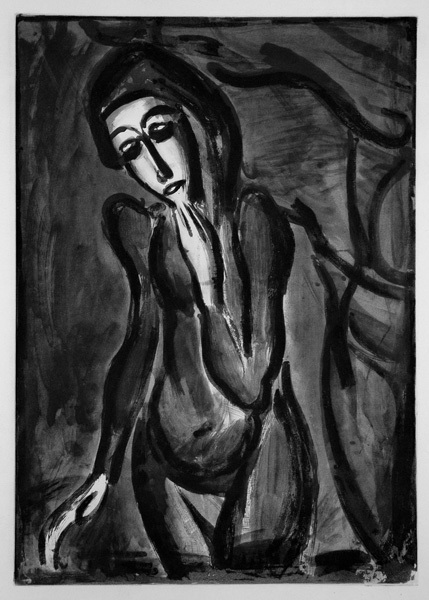 Rouault continues his theme depicting one of those who give in to despair. There are no pencil-signed proofs. Image size: 515x364mm. Price: $7000. Plate 44: Mon doux pays, où êtes-vous / My sweet country, what has become of you?] (C&R 97d). Original aquatint, drypoint, burnisher, roulette, 1927. 450 impressions signed and dated in the plate on the lower left for the Miserere (there are no pencil-signed impressions). In a landscape filled with dead or wounded soldiers beneath a sky polluted by the smoke of burning buildigs, all that remains are the runins of what was once a paradise. Ours is a very good dark impression with full margins in excellent condition. Image size: 505x655mm. Price: $6500. Plate 45: La Mort l'a pris comme il sortait du lit d'orties / Death took him as he rose from his bed of nettles (C&R 98f). Original etching, aquatint, roulette, drypoint, burnishing, 1922. 450 impressions for the Miserere. Signed and dated 1922 bottom right. As if on cue, death appears as both victim and executioner. There are no pencil-signed proofs. Image size: 537x332mm. Price: $6000. Plate 46: "Le juste, comme le bois de santal, parfume la hache qui le frappe" / The just, like sandalwood, perfume the ax that strikes them (C&R 99e). Original etching, aquatint, roulette, drypoint, burnishing, 1926. 450 impressions for the Miserere. Signed and dated 1926 bottom right. 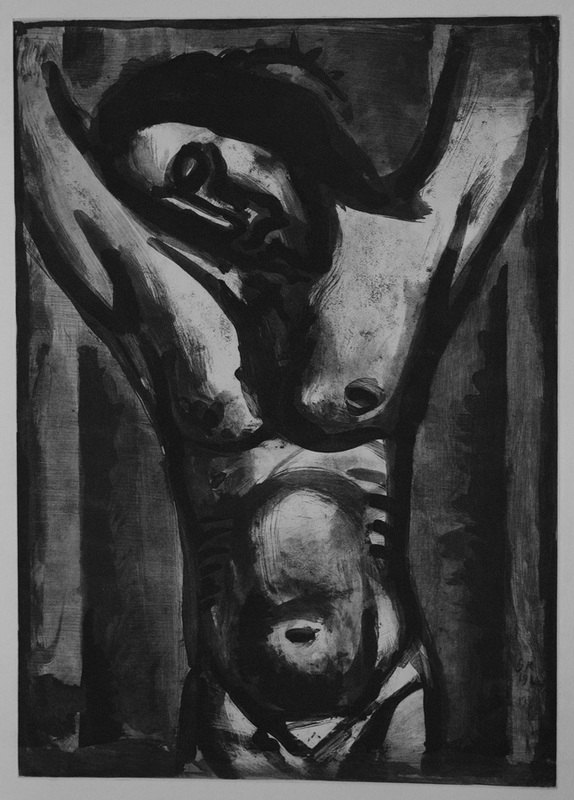 Rouault returns to the perspective offered by the titlepage to the Guerre section of the Miserere. 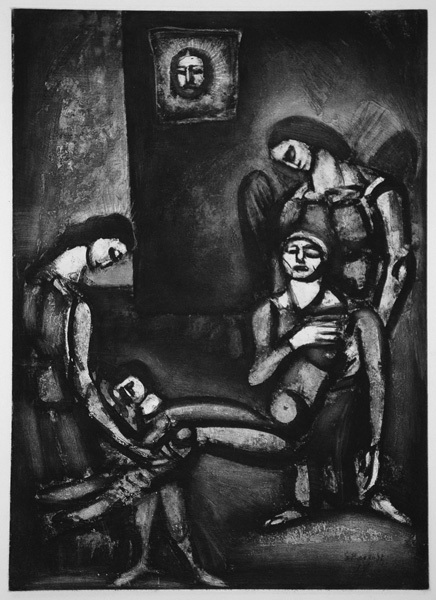 Under the gaze of the face of Jesus on Veroica's veil presiding over the group carrying the dead bodya mother, child, and a winged angel at rightdeath is transformed from horror to sanctification. 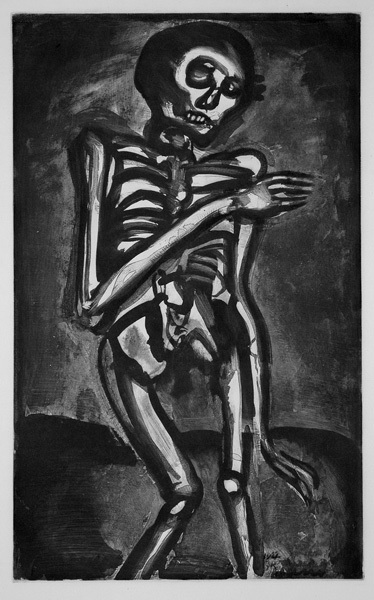 The dead man, no longer a skeleton, but a figure whose face and upper body are illuminated by light, is still loved even in death. There are no pencil-signed proofs. Image size: 585x422mm. Price: SOLD. Plate 47: De profundis / From depths of soul, I cry to you, O Lord [Psalm 130,1] (C&R 100e). Original aquatint, drypoint, burnisher, roulette, 1927. 450 impressions signed and dated in the plate on the upper left for the Miserere (there are no pencil-signed impressions). Ours is a very good dark impression in excellent condition. Once again the face of Jesus on Veroica's veil presides over the dead body, now clearly marked as an acceptable sacrifice, like Jesus himself. The title comes from the greatest of David's Penitential Psalms begging for God's forgiveness for his sins, Psalm 130, in which David finally and fully realizes that the forgiveness he seeks is not something to be earned but a free gift of God who alone can offer it. Image size: 436x602mm. Price: SOLD. Plate 48: Au pressoir le raisin fut foulé / In the winepress the grapes were crushed (C&R 101d). 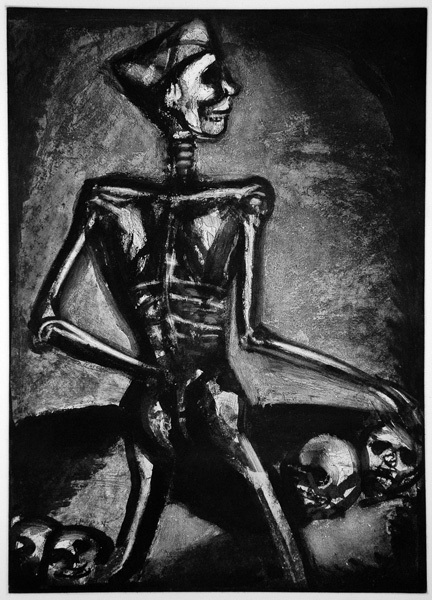 Original aquatint, drypoint, burnisher, roulette, 1922. 450 impressions signed and dated in the plate on the lower left for the Miserere (there are no pencil-signed impressions). Ours is a very good dark impression in excellent condition. 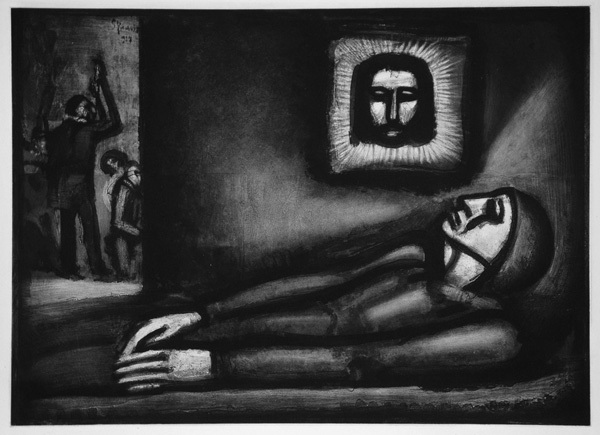 This piece has been interpreted both as the entombment of Jesus and as the laying out of the dead man from the previous print. 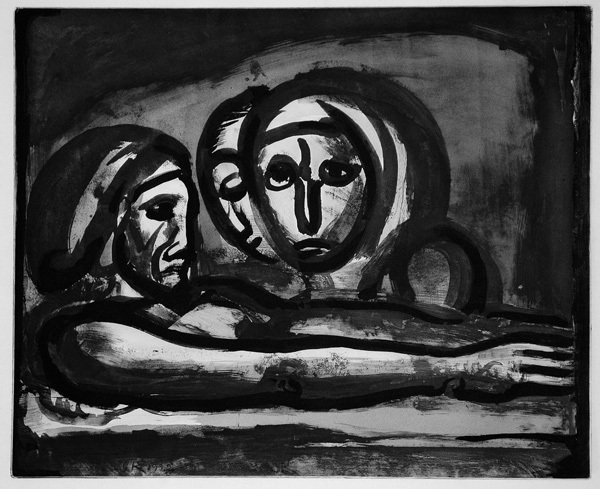 Given the differences in the face of the dead man and the presence of the women mourning him, I tend to read it as a flashback to the moment in Jesus's Passion when all hope seemed to be lost. Image size: 395x485mm. Price: SOLD. Impressionist and Post-Impressionist Prints and Drawings: Prints by Pierre Bonnard, Georges Braque, Charles Camoin, Mary Cassatt, Paul Cezanne, Henri Edmond Cross, Edgar Degas, Sonia Delaunay, Maurice Denis, André Derain, Susanne Duchamp, Raoul Dufy, Jean-Louis Forain, Paul Gauguin, Marie Laurencin, Edouard Manet, Henri Matisse, Joan Miro, Berthé Morisot, Pablo Picasso, Pierre Auguste Renoir, Georges Rouault, Ker Xavier Roussel, Paul Signac, Henri Toulouse-Lautrec, Suzanne Valadon, Maurice de Vlaminck, James A. McNeill Whistler, and others.